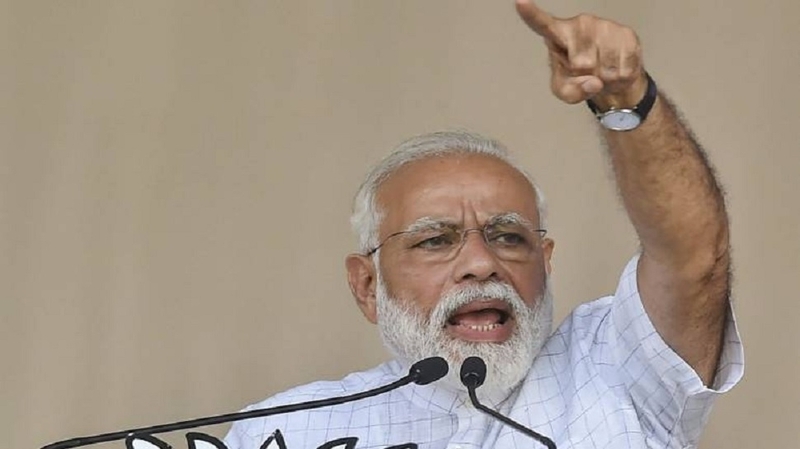 KEEPING the spotlight on national security, Prime Minister Narendra Modi on Tuesday made a big pitch for a strong Government at the Centre, citing that the Balakot airstrike has created fear among the terrorists and nightmares for those in power in Pakistan. Addressing election rallies in Chitradurga and Mysuru, Modi asked the first time voters across the country to vote after thinking, to bring a strong Government in the country. “You can dedicate your first votes to brave soldiers who laid down their lives for the country, for getting house to a poor, for free healthcare for poor, for getting water to farmers land. Your first vote should go for getting Mudra loan to some one who may be friend of yours,” he said. Asserting that a strong Government alone can take firm decisions for the benefit of the country, he referred to the Balakot airstrike in response to the Pulwama terror strike that claimed the lives of 40 CRPF Jawans in Jammu and Kashmir. “There was a time five years ago, when Pakistan’s terrorists used to attack us and Pakistan used to threaten us. Our brave soldiers used to seek permission for action, but the Government then sat in fear.” “This Chowkidar (watchman) has changed the situation. Now if there is fear, it is on the other side of the border. People sitting in power there are getting different types of nightmares...Terrorists are frightened after Balakot attack,” he said. Devoting a significant part of his speech to national security, he asked the crowd, “when we attacked Pakistan’s terrorists did you like it or not? Are you happy? Did I do right?” to which it roared in approval. Modi said the Opposition also made fun of India’s A-SAT (anti-satellite test) “Mission Shakti” on March 27 that put the country as a space power on par with the United States, Russia and China. “They also made fun of strike in the space, like they did with (Balakot) airstrike. Whole world agreed that India has made an achievement relating to space, but in their habit of opposing Modi, they are opposing India,” he said. The Prime Minister said these people while in power did not have the ‘courage’ to permit scientists to conduct missile tests. But now when India conducted space strike, they were the first in raising questions on it, he added. “These people neither respect jawans, nor science. Those who don’t care about India’s pride, it is necessary to teach them a lesson,” he said. At his Mysuru rally, Modi took on the Congress, saying its vision and agenda was to remove him, which was also shared by “Mahamilavat companions,” a derisive reference to the “grand alliance” formed on anti-BJP plank. “You may have heard their programmes and speeches, you may have heard Mahamilavat companions. They have one thing Modi hato, modi hatao..Your love is not giving them sleep,” the Prime Minister told the crowd. During the Congress’ rule, a number of terror incidents that took place were linked to Pakistan, but their leaders spread lies about Hindu terrorism. “When our soldiers for the first time entered inside Pakistan and attacked terrorists, they asked for evidence.” “Is sapoot (brave son) big or sabot (evidence)? Do you believe our Army, on their bravery,” he asked the gathering. “He was trying, was looking for safe seat in Karnataka, but he was aware of public mood and also had doubts about JD(S)”, Modi said. He said there was a thinking that since Deve Gowda was “backstabbed” and removed as Prime Minister (in 1996) by “Madam Soniaji, and Deve Gowda may take revenge through madam Soniaji’s son, then what will happen. So leaving Karnataka, he is fighting in Kerala.” Modi said Congress leaders had made Chief Minister H D Kumaraswamy a “punching bag” and the whole country was watching the “blackmail politics” happening in Karnataka. “This is family first politics, dynasty politics, corrupt politics, because of which there is anger against Congress and its companions,” he said. Calling Sabarimala a strong part of “our faith”, Modi said the feeling in the country on the issue was also the feeling of BJP. “All efforts will be made that Sabarimala’s faith, traditions and pooja practices are placed in front of the Supreme Court in detail. We will try that issues of faith and beliefs get constitutional safeguards/protection,” he said. He was referring to the Supreme Court lifting the ban on the entry of menstrual age women into the Lord Ayyappa temple in Sabarimala in Kerala. He said the Congress consented with Communist attack on our faith on the Sabarimala issue. “Now when Congress’ naamdar went to Kerala to fight election, first thing he said was he will not speak anything against the Communists. This is Congress’ truth. We have to beware of Congress and its companion’s politics,” he said. BJP is betting big on Karnataka, its main hope in the South, where it is eyeing to bag a majority of the 28 Lok Sabha seats, elections for which will be held in two phases on April 18 and 23. In 2014, it had won 17 seats and is targeting 22 now. BJP, which ruled Karnataka from 2008 to 2013, had also emerged as the single largest party in the May Assembly polls.